About 10-15% of all clinically recognised pregnancies result in spontaneous miscarriage1. Chromosomal aneuploidies are the most common cause of first trimester miscarriage, accounting for approximately 50% of spontaneous abortions2. 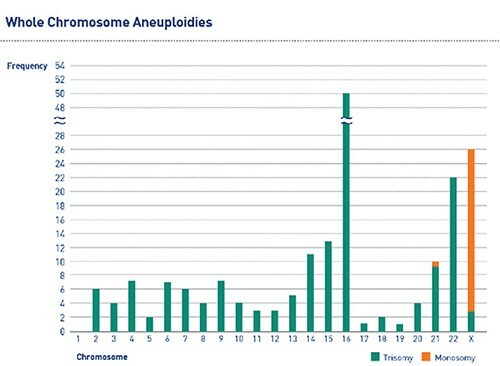 Aneuploidies observed in products of conception (POCs) involve almost every chromosome (Figure 1), with trisomies being the most common chromosomal abnormality3. Karyotyping is a conventional method for chromosome analysis of products of conception (POCs). While karyotyping plays an important role in investigating the reason for miscarriage, the technique is hindered by high failure rates (due to cell culture failures) and maternal cell contamination. Molecular approaches to quantify chromosomes, such as fluorescent in situ hybridisation (FISH) and quantitative polymerase chain reaction (qPCR), overcome some disadvantages of karyotyping, but are also limited as they are restricted to coverage of only a subset of chromosomes, which may only account for up to approximately 58% of aneuploidies (and hence miss up to 42% of aneuploidies)3. Molecular karyotyping techniques using array comparative genomic hybridisation (aCGH) or next generation sequencing (NGS), overcome limitations of other technologies, by offering comprehensive chromosome screening (screening Chromosomes 1-22, X&Y) and do not require cell culturing (mitigating test failures). Considering the high incidence of genetic factors causing miscarriage, there is value in testing POCs following an early pregnancy loss. The majority of miscarriages are as a result of sporadic chromosomal abnormalities, and the risk of recurrence of such foetal aneuploidies decreases in subsequent pregnancies4. Although many chromosomal abnormalities that cause miscarriages are sporadic and have a low recurrence risk, some abnormalities (such as translocations) are expected to significantly increase the risk of recurrence – which may necessitate parental karyotyping. By identifying the approximately 50% of women whose pregnancy loss was due to chromosomal abnormalities, comprehensive chromosome screening will prevent a large proportion of patients undertaking unnecessary and costly evaluations5. Furthermore, the psychological benefit of identifying the aetiology of a foetal loss, cannot be understated5. Conversely, if a foetal chromosomal abnormality is excluded, there may be a possible treatable physiological cause for a given miscarriage, and investigations can be focussed on identifying this. Genetic testing outcomes can therefore be used to guide counselling for future pregnancies. Editing Embryos- playing God or our responsibility? Jaysen obtained his PhD in Human Genetics from the University of the Witwatersrand, South Africa, in 2014, which was part of a split-site doctorate with the University of Cambridge, UK. Jaysen’s primary area of research has been investigating the effects of environmental factors on epigenetic signatures in gametes. Jaysen is a Medical Biological Scientist registered with the Health Professions Council of South Africa (HPCSA). Jaysen also holds a Postgraduate Diploma in Management (PDM) which he obtained from Wits Business School in 2014. Jaysen holds an honorary lectureship position at the University of the Witwatersrand, where he lectures on epigenetics and reproductive genetics, and supervises a number of postgraduate degrees. In August 2013, Jaysen was approached by Genesis Genetics Inc. to open a laboratory in Johannesburg, South Africa, to offer reproductive genetic testing services. Following the acquisition of Genesis Genetics South Africa by Next Biosciences in April 2016, Jaysen was appointed as its Managing Director, where he manages reproductive genetics services.